Photo courtesy of Tony Kunen. Found at bathroom in Pattaya, Thailand. Do it nasty on the counter, instead. So I can’t have a smoke afterwards either. I will not do it wet on a boat, with a goat, on a train or in the rain. I do not like it in a box. Or with a fox. Not in a house, or with a mouse. pardon me? where is the bladder control supply shelf? Yet another wet-disaster-like interdiction…. Wheeeen will they stoooop?! But peeing on the walls and ceiling is encouraged. Velcro harnesses and a ladder have been provided to reach the ceiling. You and your partner will be expected to provide the wetness. Step up closer guys. It’s not [i]that[/i] long. Looks like someone needs a towel. The floor is wet with gasoline, hence the no smoking sign. Match in the gas tank, boom boom! You know it isn’t right. Whatever you do in there, don’t miss! That’s what happens when you put toilet paper into the toilet. Be warned! Don’t do WHAT? 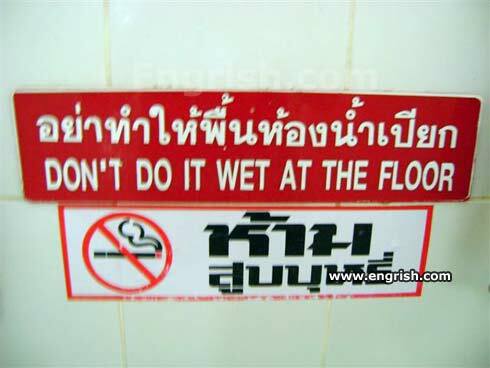 wet at the floor? I wonder how many have to pee on the floor to warrent this sign? Gross neople! but to the floor is okay.